It has about 15 surface mount parts on the board underside, and it was tempting to use solder paste / cream and hot air to solder the parts on… less risk of flicking them on the floor and the self align due to surface tension in the molten solder. I found a tube of solder cream with a use-by date of over three years ago, and it was blocked at both ends. Releasing the plunger seal, and drilling the solid core out of the output end, a new dispensing needle, new o-ring for the adapter and it was working reasonably. 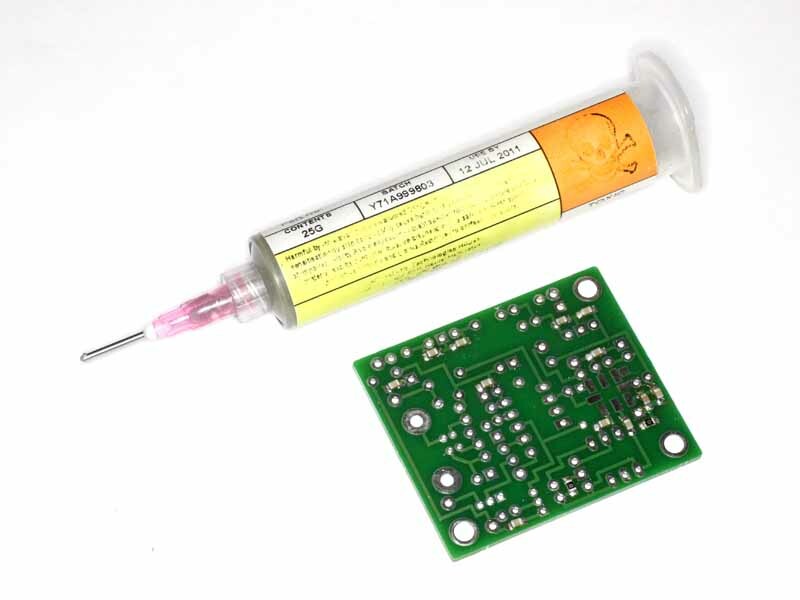 This goes in a machine that pulses a controlled measure of air behind the plunger seal and dispenses a measured amount of solder cream from the dispensing needle… quite good for hand preparation of boards of this type. So, was the solder cream going to be any good? At around $40 a cartridge, buying a new one for this project would not be justified. Well, although it had been stored in a cool place all that time, it had clearly absorbed some moisture. On heating, the cream bubbled and exploded flick the part off the pad. The answer was to heat it gently allowing the cream to sputter a bit as it boiled dry, then bring the hot air closer and flow the solder. Time to put all the through hole components on, then hand solder the Si570 synth chip under the board and it should just work.